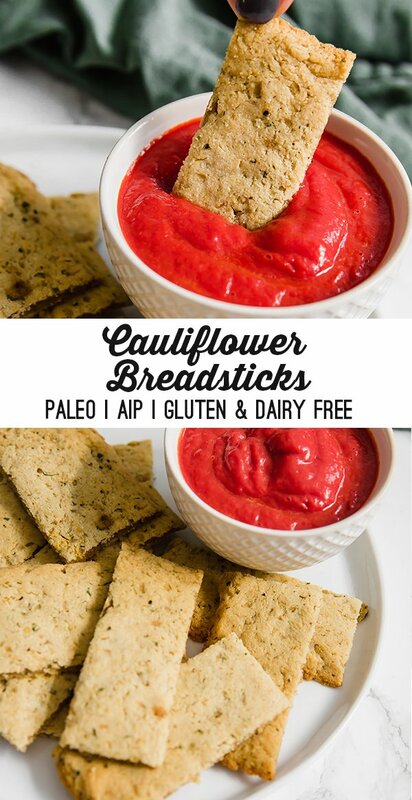 These cauliflower breadsticks are perfect for snacking and dipping! They’re paleo, AIP, dairy free, gluten free, and nut free. Guys. Breadsticks. Breadsticks are life. Well, breadsticks were life. I used to order from pizza places just so I could get breadsticks sometimes. 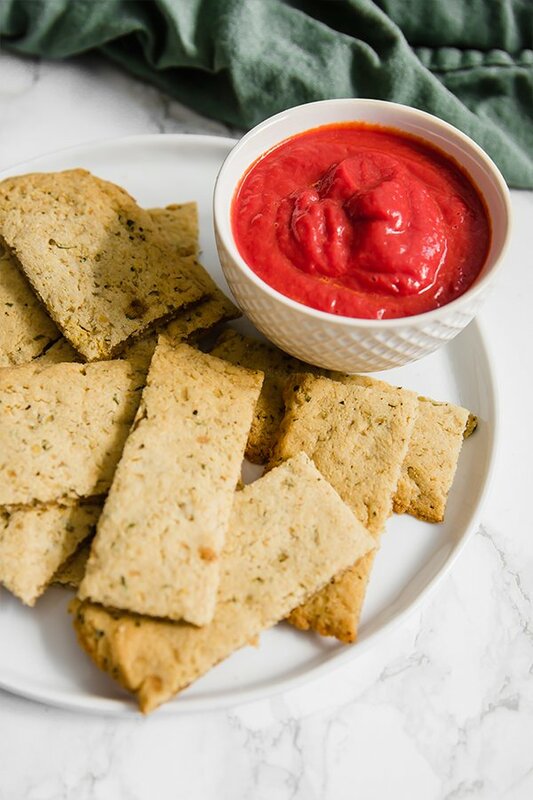 Some well seasoned, cheesy, soft yet crispy breadsticks dipped in marinara sauce are just so good! Breadsticks are one of the things that I miss most! There are a lot of recipes out there for gluten-free cauliflower breadsticks made with lots of cheese. It helps to hold the breadsticks together and makes it taste like pizza. But what about those of us who are dairy free? We still want gluten and dairy free breadsticks! That’s why I made these! These cauliflower breadsticks are dairy free, grain free, nut free, and easy to make egg-free and AIP. 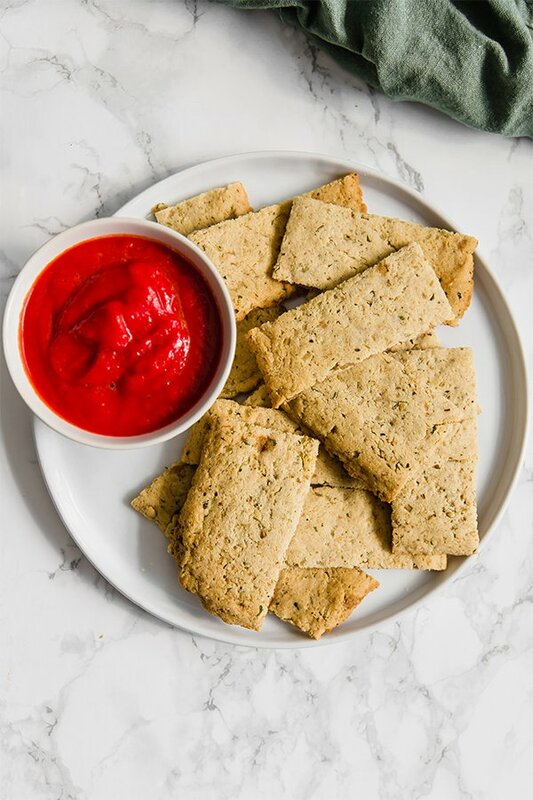 They’re perfect for dipping in nightshade free marinara sauce, serving as an appetizer on Italian night, and a great super bowl snack! I always buy cauliflower pre-riced and frozen from Whole Foods or Trader Joes for convenience. However, you can easily rice your own cauliflower by adding florets to the food processor. Though I prefer arrowroot starch here, you can use tapioca as well. I would not suggest swapping the coconut flour. This helps make the breadsticks taste cheesy! You can likely use avocado oil but olive oil has a much better flavor here. If you’re egg free, you can use a gelatin egg substitute. You’ll find the instructions in the recipe. Add the riced cauliflower to a medium pot and cover with water. Bring to a simmer and cover for 7 minutes to steam the cauliflower. Remove the lid, strain the excess water and allow the cauliflower to cool before using a cheesecloth or nut milk bag to remove all water from the cauliflower. Combine the dry ingredients in a large mixing bowl and mix well. Add the riced cauliflower and stir. Incorporate the olive oil, apple cider vinegar and egg (or gelatin egg) and stir until a dough forms. Flatten the dough on the baking sheet and form into a large rectangle. Bake in the preheated oven for 15-20 minutes or until lightly golden brown and crispy. Remove from the oven and use a pizza roller to slice into 14-16 slices. Serve warm with tomato sauce or nightshade free marinara. For the gelatin egg substitute – Add 1/4 cup water to a small sauce pot and slowly sprinkle in 1 tbsp of gelatin. Use a fork to gently mix in any clumps. Set aside and allow the mixture to harden for 2-3 minutes. Place the pot on the stove and turn the heat on low heat. Slowly melt the gelatin over 1-2 minutes. Immediately remove from heat once the gelatin has melted and the mixture has returned to liquid. Vigorously whisk the liquid until it becomes frothy. Pour it into the breadstick mixture immediately to swap for an egg. All nutritional information is an estimation and not exact. The photos of this recipe and all written content on my website are copyright protected and cannot be copied or shared. 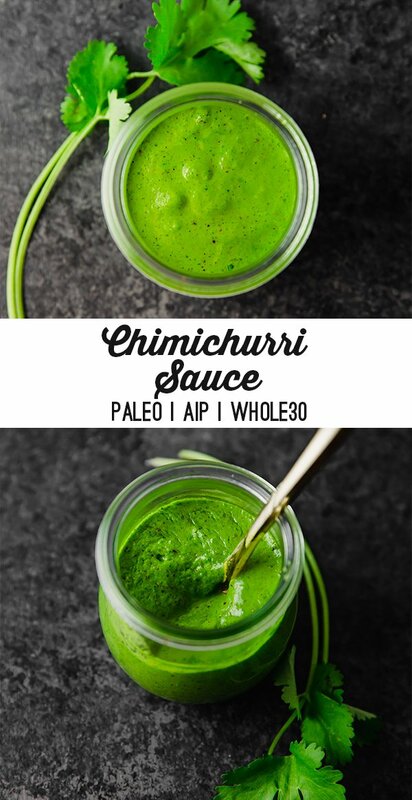 Please do not copy this recipe or photos and share it on your own website, Instagram, or other written materials. If you’d like to tell people about this recipe on social media, your own website, or elsewhere please link back to the recipe here rather than copy and pasting. Thank you so much!! 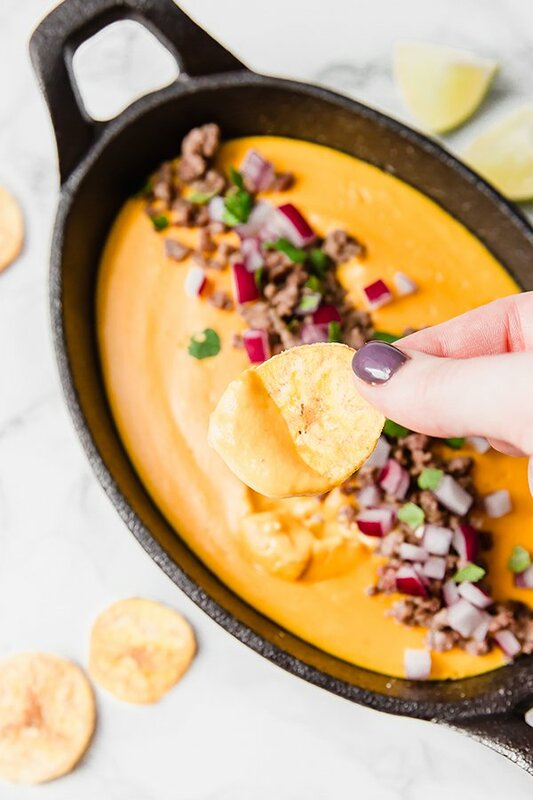 This dairy-free queso is perfect for a party! It’s made with sweet potato, butternut squash, and is paleo, AIP and nut free. Queso is one of those things that everyone loves! Well… everyone who eats dairy. If you don’t eat dairy and you’re having to be around some chips and queso, you’re probably going to feel pretty sad. Trust me, I live in Texas… I’ve been there. I’ve sat with an empty plate at Chili’s while everyone was digging into queso and wishing that I could have some too. But between the dairy, beans, and nightshades, it just wasn’t happening. 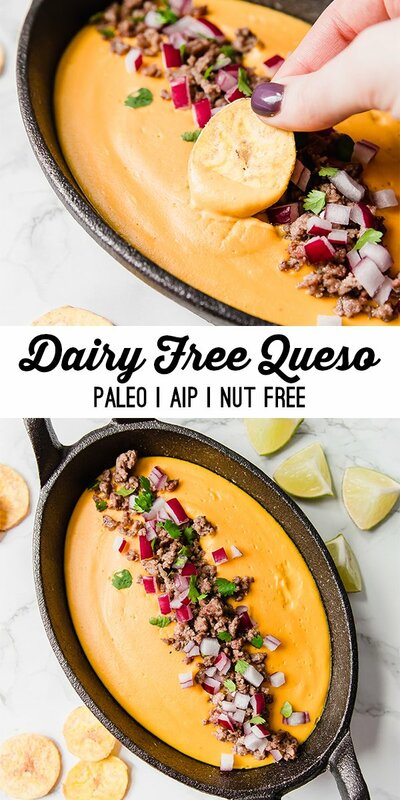 There are indeed more options for dairy-free queso popping up, but most of them are made with cashews, which sounds amazing but is a bummer for those of us who are nut free. With super bowl Sunday around the corner, I decided to make this dairy-free queso dip that’s free of cheese, nuts, and nightshades! 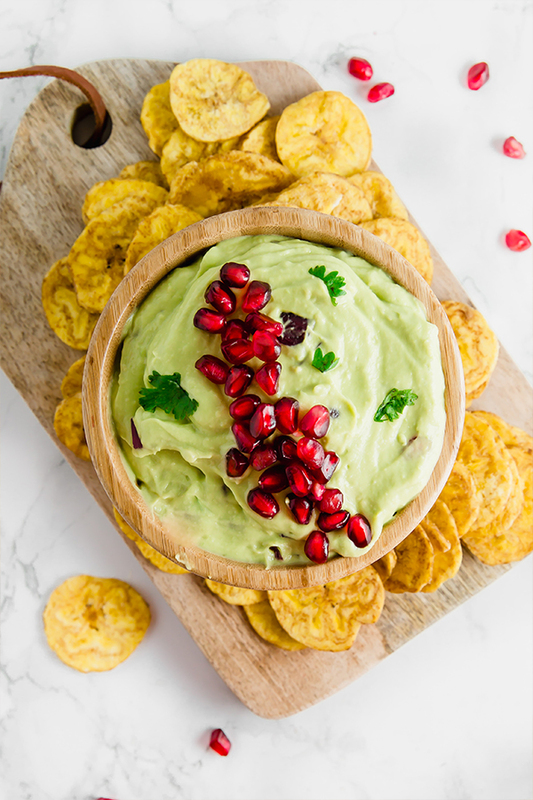 It’s made with vegetables, nutritional yeast, and more to create a thick, creamy, and cheesey tasting dish that you will love dunking plantain chips into. I highly recommend using white Hannah sweet potatoes for this recipe as it will produce more savory tasting queso. Orange sweet potato will produce more of a traditional cheesy color but will be a lot sweeter. I often find Hannah sweet potatoes at Whole Foods and Natural Grocers. This helps to add more color to the queso and more flavor profile than just using sweet potato. These add a savory flavor to the queso. These are the liquids used for the queso. If you don’t tolerate coconut, you swap it out for more chicken broth. This is the secret ingredient in dairy-free cheese recipes! You can buy this online or in health food stores. Using a medium-sized pot, heat the avocado oil over medium heat. Add the onion and garlic and saute until the onion is translucent. Add in the sweet potato, butternut squash, broth, coconut milk, nutritional yeast, salt, and pepper and stir well to combine. Bring to a low simmer and reduce the heat to medium-low. Cover the pot and allow to simmer for 15 minutes. The vegetables should be fork tender. Allow the mixture to cool slightly before adding to a blender along with the arrowroot starch. Blend until smooth and thick. 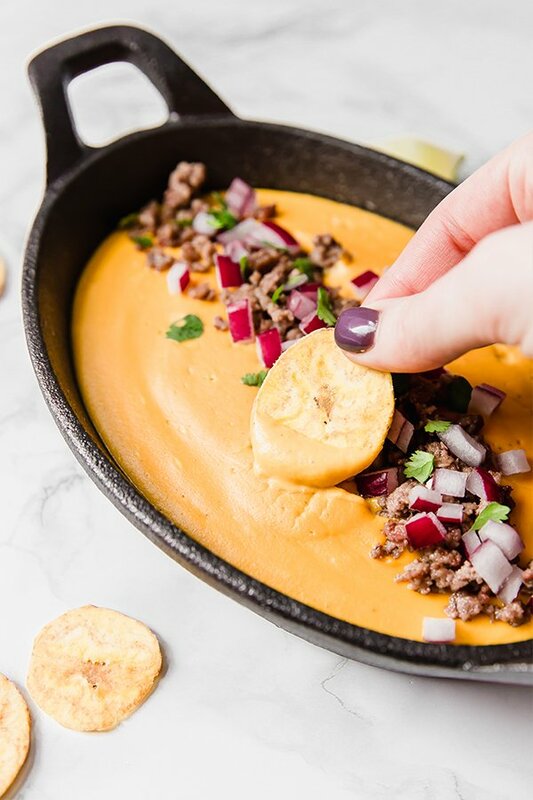 Serve the queso topped with optional toppings and with chips like plantain chips. For the sweet potato, use White Hannah Sweet Potato for less sweet queso, and orange sweet potato for slightly sweeter queso. 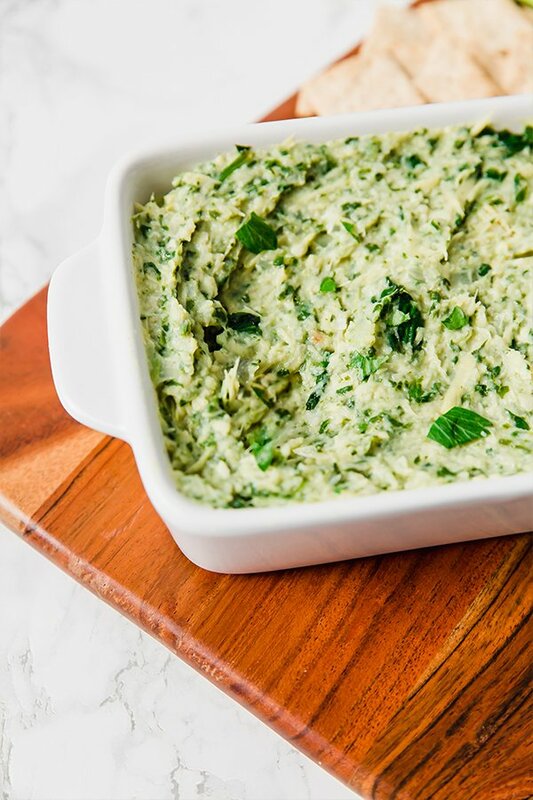 This paleo spinach and artichoke dip is a delicious party appetizer! It’s dairy-free, AIP, and whole30. It isn’t a party without spinach and artichoke dip, right? 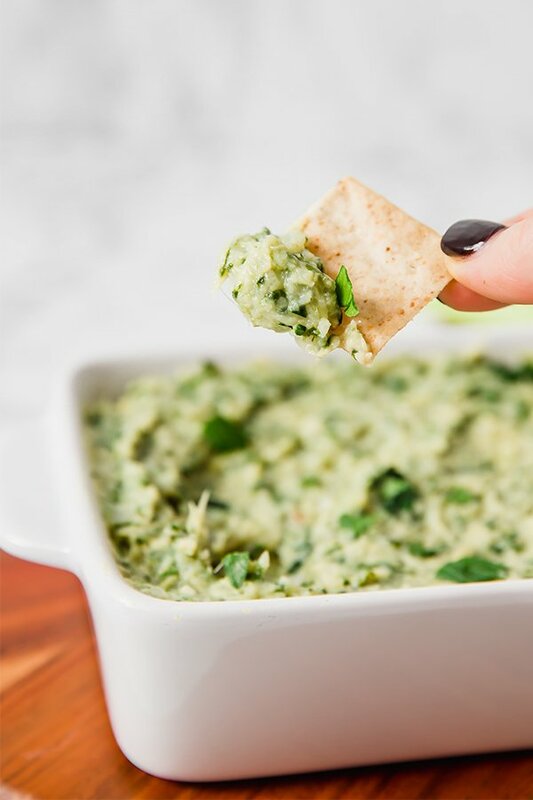 I’ve been to parties with people who really don’t like vegetables, but love spinach and artichoke dip! It’s honestly the perfect way to casually sneak in some vegetables that are disguised as a decadent snack. Well, in reality, spinach and artichoke dip is usually all cheese, sour cream and canola oil based mayo… not really that healthy for those who have food intolerances. Not this one! 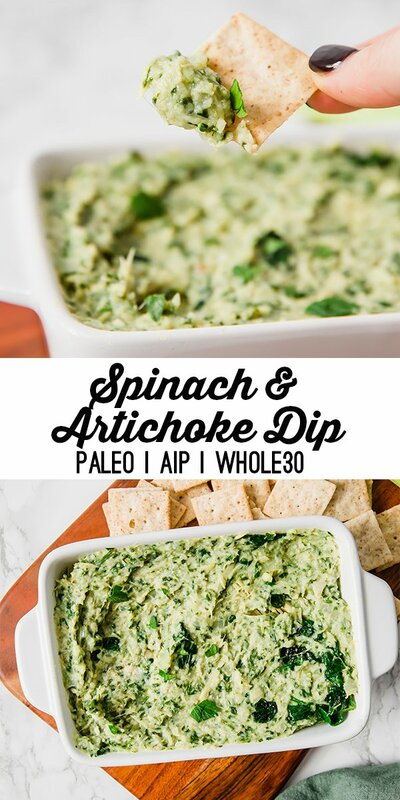 This spinach and artichoke dip is dairy free, AIP, paleo, and whole30 compliant! 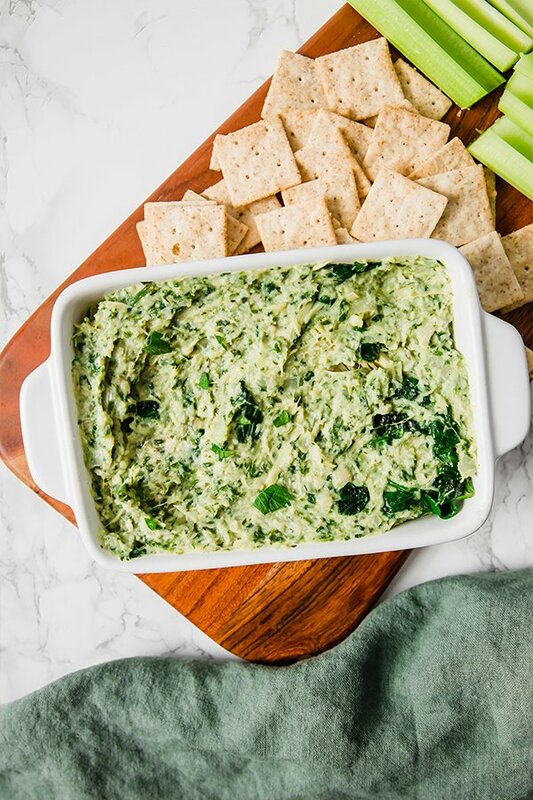 This spinach and artichoke dip is so perfect for holiday parties, dinner gatherings, or as a game day snack. But honestly, it’s so easy to make and pretty cheap to do so that you may just wind up keeping for yourself as a little snack or side dish! The spirit of Whole30 is to eat full meals and not sit down with a big bowl of chips and dip. But, if you moderate this recipe and eat it with vegetables it’s technically made with all compliant ingredients. To keep it AIP, all you need to do is just eat it with veggies or a homemade AIP cracker… that’s it! Since this recipe is AIP, it doesn’t use nuts and dairy. Mashed cauliflower replaces the consistency of what you would get from something like cheese or cashews. Artichoke hearts actually have an amazing consistency when blended! You can use canned artichoke hearts, or if you want to avoid citric acid, you can often find frozen artichoke hearts in many stores. Can’t do this dip without it! These add a lot flavor to the dip. This is technically optional, but it creates a cheesy flavor. First, steam the cauliflower by adding about 1/2 an inch of water to a pan and bring to a simmer. Add the cauliflower and cover the pan for 5-8 minutes or until the cauliflower is soft. Drain the excess water, and set the cauliflower aside. Add the avocado oil to a frying pan and bring to medium heat. Saute the onion and garlic until fragrant and translucent. Remove from the pan add to a blender and reserve about 1 tbsp of oil in the pan. Set aside. 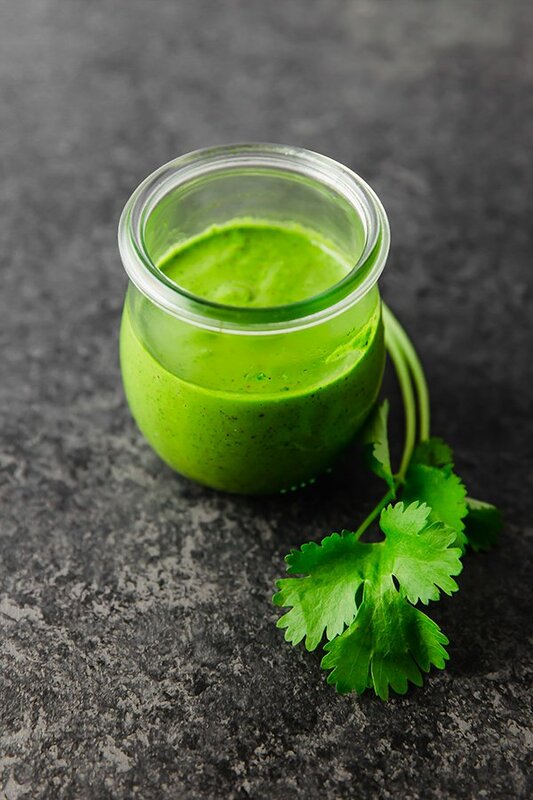 Using a high-speed blender, combine all of the ingredients (reserving the spinach) and blend until smooth. Add the chicken broth to make the dip creamier if desired. Spoon into a bowl or serving dish and set aside. Using the same frying pan, wilt the spinach on medium heat for 1-2 minutes. Stir into the dip and mix well. 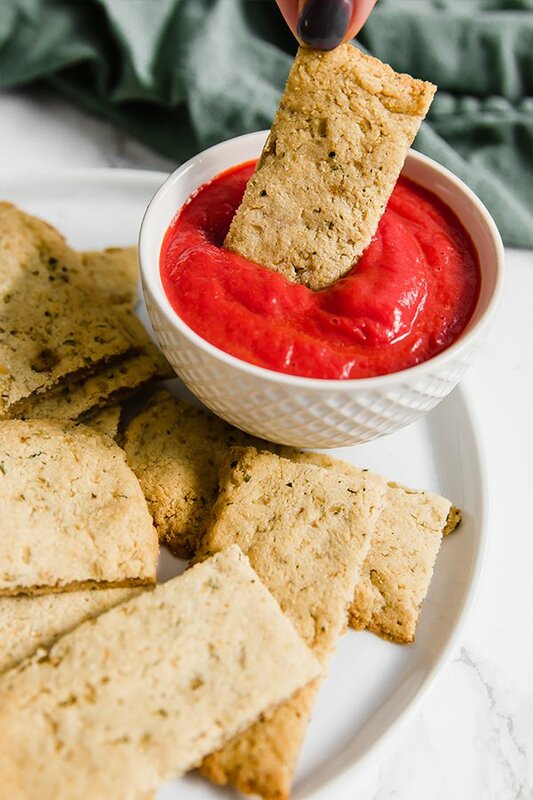 Serve the dip warm with simple mills crackers, or vegetables like celery and carrots for AIP & whole30. If you make this ahead of time and serve it at a party, feel free to heat it in the oven for 5-10 minutes at 350F. 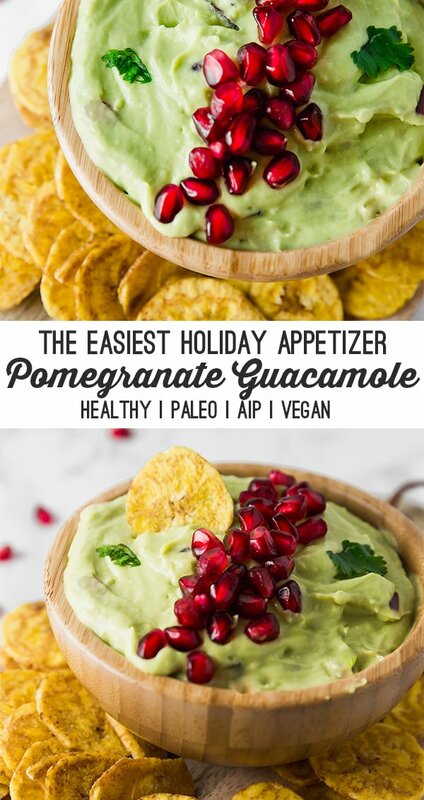 This pomegranate guacamole is the easiest holiday appetizer! 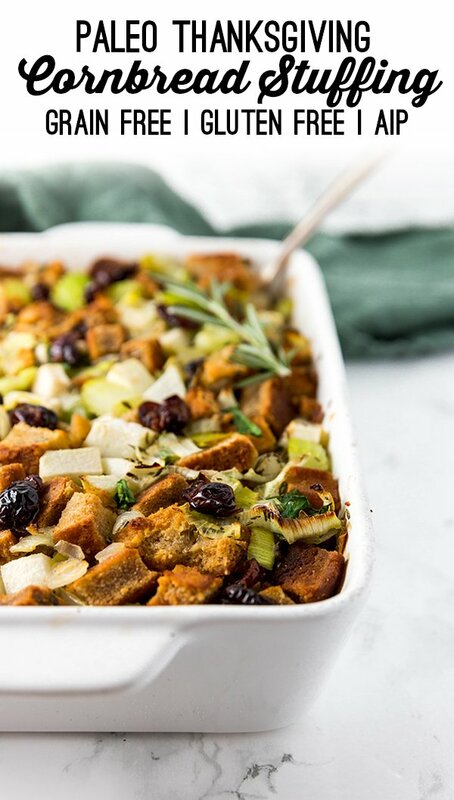 It’s paleo, AIP, vegan, and a total crowd pleaser with all holiday guests. During the holidays, the very last thing I want to do is prep another labor-intensive dish! Between all of the complicated sides, desserts, main dishes, and just the overall stress of the holiday season, there comes a point where you just want something simple that everyone will love. 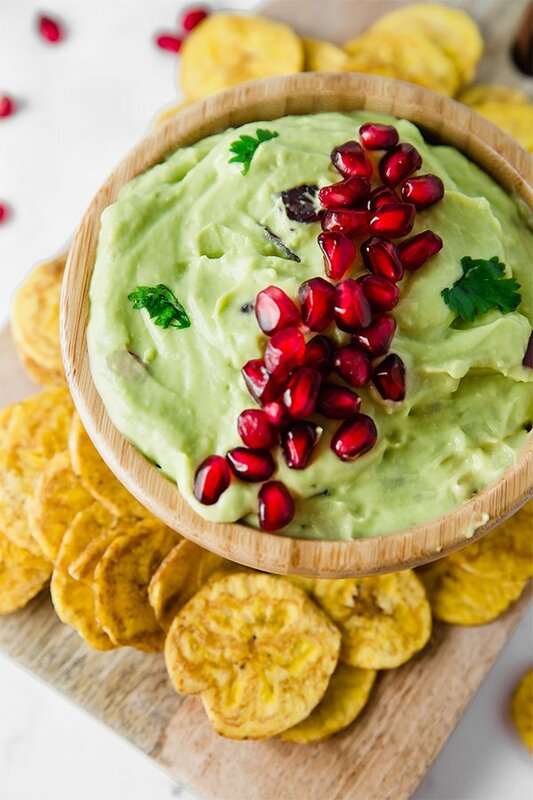 And really… who doesn’t love guacamole? Especially now, in the decade where when we’re all obsessed with avocados. Bring on the guac! But guacamole by itself is a little blah for a big holiday dinner. Why not dress it up just a bit with pomegranate? Now we’re talking, right?! Now it’s a festive, and unique appetizer while still being totally easy. 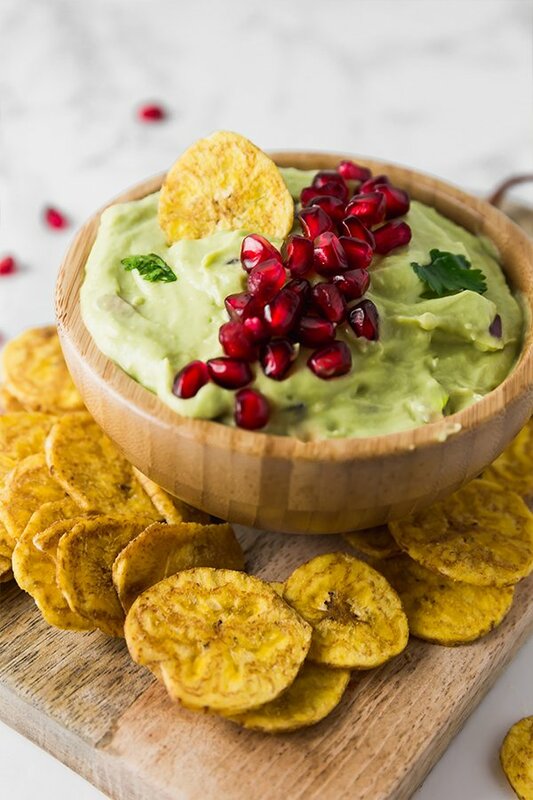 I love adding avocado oil to guacamole to give it a creamier texture. Lime juice adds the acid needed to give the guacamole more flavor. This adds a little bit of spice and some more texture. Never had pomegranate before? Guys now is the time to try one! A pomegranate is a large red fruit filled with these amazing little seeds/ arils that taste so incredible. You can technically buy the seeds by themselves, but it’s seriously too pricey for my taste. Getting the seeds out can be a challenge, yes. This is one way to process it quickly! Pomegranate seeds are great on salads, roasted vegetables, and in other savory dishes. I actually really love using them to decorate cookies at Christmas as well. They’re not too sweet which is was I thought it would be great for this guacamole… and it is! 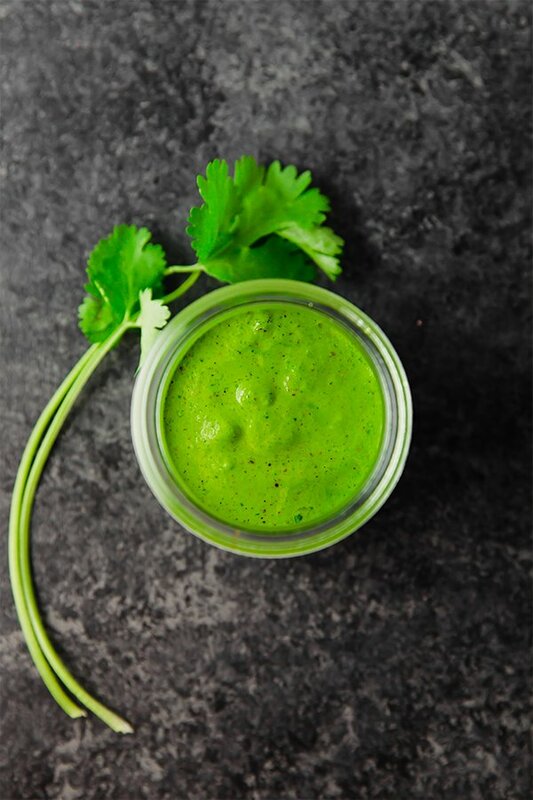 Using a high speed blender, blend the avocado, avocado oil, lime juice, and garlic until creamy. Remove from the blender and spoon into a bowl. 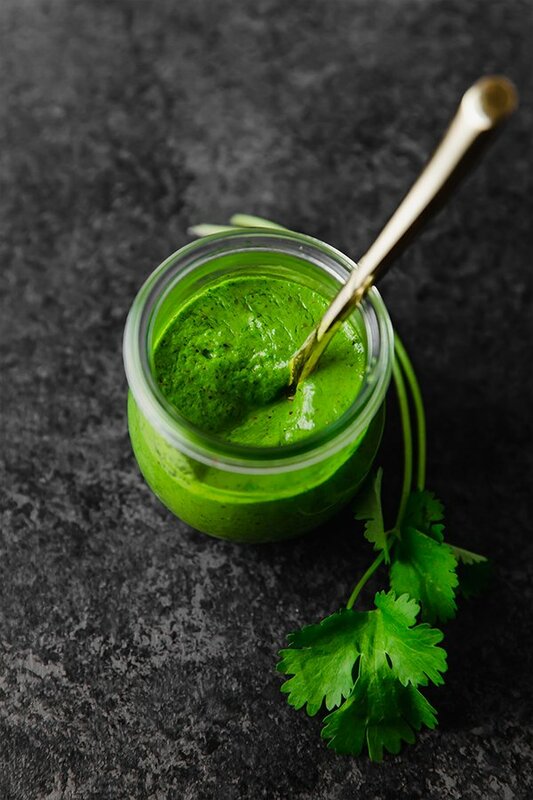 Mix in the remainder of the ingredients (reserving some cilantro and about 2 tbsp of pomegranate seeds for topping) and mix well. Garnish with pomegranate seeds and cilantro and salt further to taste if desired. Serve with plantain chips or sliced veggies. Hello! The photos of this recipe as well as the photos and written content on my website are copyright protected and cannot be copied or shared. Please do not copy this recipe or photos and share it on your own website, Instagram, or other written materials. If you’d like to tell people about this recipe on social media, your own website, or elsewhere please link back to the recipe here rather than copying it. If you’d like to use a photo for a roundup blog post, please get in touch with me first. Thank you so much!! 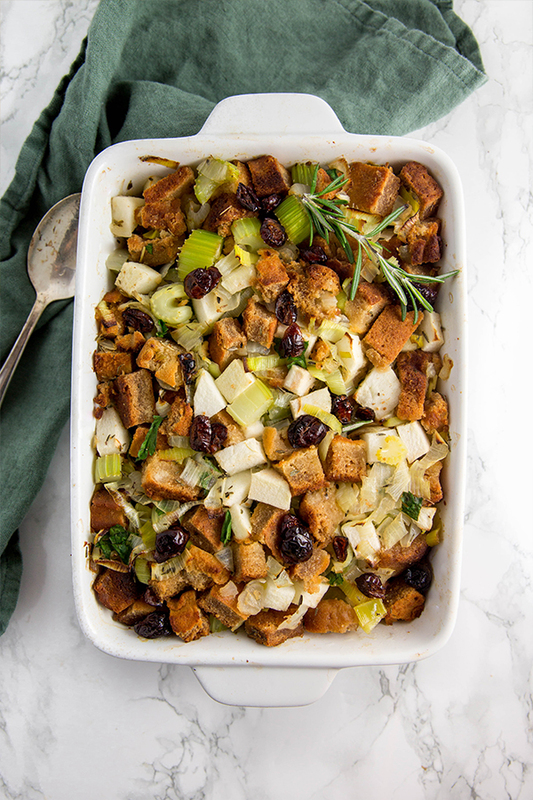 This paleo Thanksgiving Cornbread Stuffing is made with a corn-free cornbread, and all of the classic stuffing ingredients that you know and love! It’s paleo, AIP, grain free, and perfect for the holidays. When I asked some of my readers what they wanted to see for Thanksgiving, everyone unanimously said stuffing! 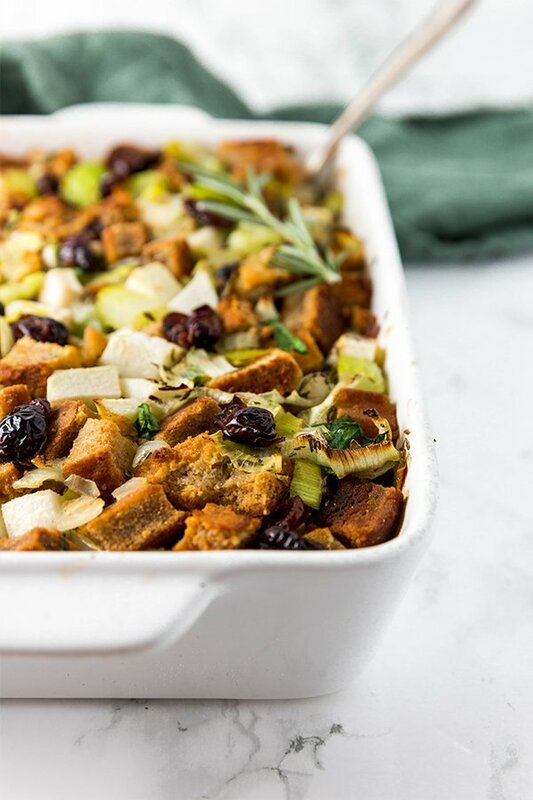 Stuffing is one of those Thanksgiving staples that you just can’t really miss. Traditionally it’s made with bread, which just isn’t happening for a paleo, AIP, or grain-free diet. There are plenty of recipes out there for stuffing with just vegetables, which I’m totally game for and have shared myself. However, what about when you’re just really craving that classic comfort food? That’s why I made this Paleo Thanksgiving Cornbread Stuffing! It’s paleo, AIP, grain free, and just like the real thing. Really, the only the only thing that’s different in this stuffing is that there isn’t any butter, and the cornbread is grain free… that’s it! Other than that, it’s just like a traditional stuffing. It’s the kind of thing where you can potentially fool Thanksgiving guests! Okay, how in the world does this work?! I have a recipe for paleo/AIP cornbread here that is made without any corn! YES! 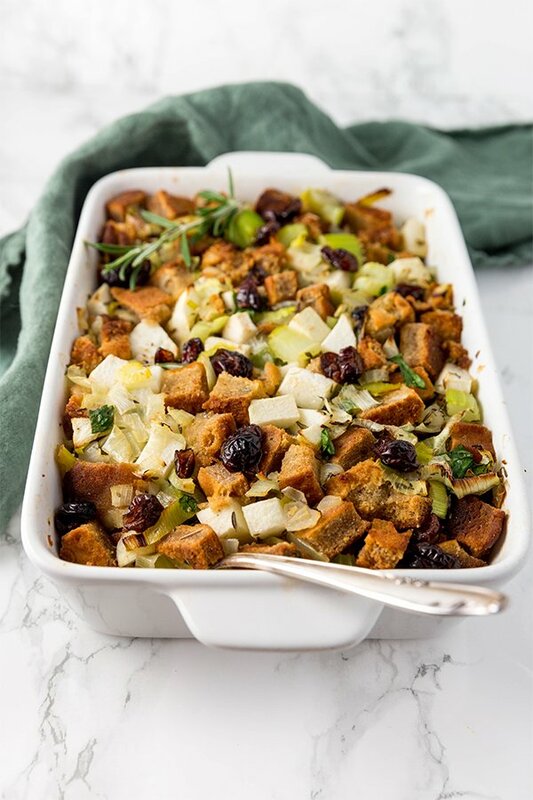 Celery and onion are classic stuffing ingredients, and I think the leeks added a little something extra. It’s currently #UWCranberryWeek so I had to get the cranberries in there! These both add some tart, sweetness. I had to hold back writing the rest of the lyrics to the Simon and Garfunkel song. Yes, there’s a reason they put all of those together in a song… they just go together! This paleo “corn”bread stuffing is the real deal! Preheat the oven to 375 F and prepare a large casserole dish. Set aside. Using a large pan, melt the coconut oil on medium heat and saute the onion until soft. Mix in the celery and leek and saute until the leeks soften. Stir in the parsley and other seasonings to combine. Set aside. Add the chopped apple, cranberries, and chopped cornbread to a large mixing bowl. Use a mixing spoon to crumble some of the cornbread. Pour the chicken broth little by little into the cornbread mixture, adding more if you prefer a more soggy cornbread. Then stir in the onion, leek and celery mixture. Stir well to combine. Spoon the stuffing mixture into the casserole dish and bake in the oven for 25 minutes or until baked to liking. Top with extra rosemary or other herbs and enjoy! This stuffing is best fresh. If you need to make it ahead and reheat it, place it back in the oven for 5-10 minutes.